It’s finally warming up in Minnesota, which means I can begin to live in my flip flops. 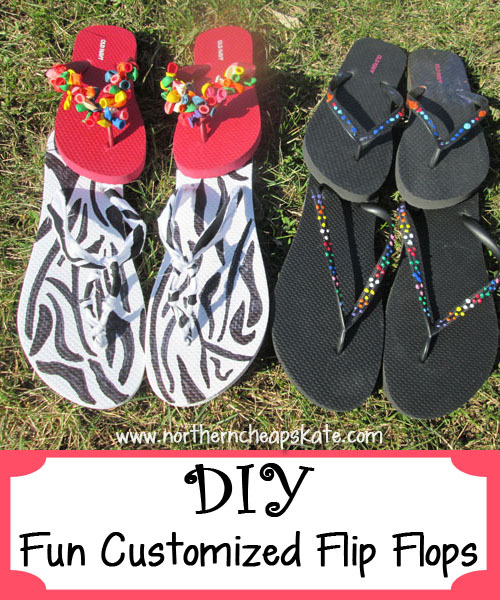 One fun thing you can try is DIY fun customized flip flops. As you can tell from the picture, these are all just solid color flip flops from Old Navy that we customized. Traditionally, Old Navy has a once a year Flip Flop Sale where they sell flips flops for the whole family for a $1 on just one weekend. 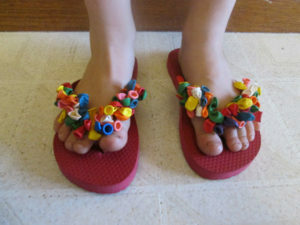 Last year I stocked up and bought some to make these Glam’ed Up Flip Flops with fabric and flowers for Camp MOM that we did with our friends. I had also bought some to make customized flip flops with my kids that we didn’t get around to doing until now. Luckily flip flops span a couple sizes, so they still fit my kids and lucky for you the sale has not happened yet so you can still try to get in on that deal. This first pair are ones I made for myself. I thought it would be fun to make a zebra print on the sole to match the leftover zebra print fabric I was using. I just used a permanent marker on the sole and transformed it from plain white to zebra print. The marker may wear off after a while, but you still have the marker, so just touch it up. To make the fabric straps, I cut away the plastic straps and cut 2 – 1″ widths of fabric about 2 times the length of the flip flop. I strung the ends of the fabric through the single hole at the front of the sole. Then I tied a double knot with the fabric. The knots rest nicely in the divots at the bottom of the shoe, but you could add a bit of glue if you wanted to. Next I tied 3 knots, tying both pieces of fabric together on the top of the shoe. Then I tied 2 single knots on each piece of fabric. Then one more knot tying both pieces of fabric together, which helps create the oval shape. Finally, I strung each single piece of fabric through the holes at the back and double knotted them in the place and cut away the excess fabric. These turned out so cute and were fun to make! I saw these a few places on Pinterest and thought they seemed like a fun pair to customize for my son. Sometimes it is not as easy to find crafts for boys as it is for girls, but they like having projects made for them just as much. I used about a half a package of water balloons to make these customized flip flops. All you have to do is tie a balloon around and double knot it to keep it in place. I just so happened to have leftover balloons from last year, so I incurred no additional cost to make these. 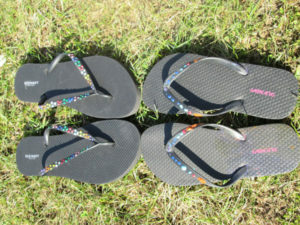 Finally the last 2 pairs are coordinating mother/daughter flip flops. We simply used puffy paint that we had leftover from making customized Camp MOM t-shirts last summer. Puffy Paint dries very nicely and sticks well to the flip flops. 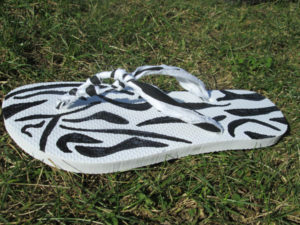 My daughter smudged some paint on the sole of one of her flip flops which gave me another idea that we may do for this year’s Camp MOM, which is to do a full painting on the bottoms of the soles (sort of like my zebra print drawing, but with puffy paint painted on with brushes). 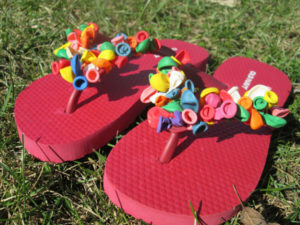 I can’t wait to wear our new fun flip flops all over the place this summer! I love the mommy-daughter flip flops … I need to do this with my girls! Those are really cute ideas. I love the one with the balloons. That is a really cute idea and I’m sure if you went out and bought fancy flip flops they would cost quite a bit. I love this idea!! I would love the zebra print for sure! I do these with my daughter’s shoes. She loves the chance to make them her own. oooh! I love the ones with the balloons! So creative and cute!